Wow. Sometimes great things happen in the tattoo world, sometimes not so great things. I guess what follows could land in both categories, although it’s a bit of a stretch to say that much about this is “great”. 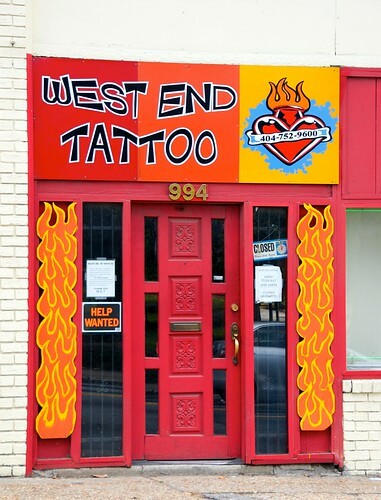 This past Tuesday evening, three armed suspects attempted to rob Atlanta’s West End Tattoo. The shop owner (whose name doesn’t seem to have been released to the media – and for good reason, I suppose), managed to get his hands on his own 9mm handgun. A gutsy move on the owner’s part, no doubt, which ended in the owner shooting and killing one of the robbers. The other two robbers fled West End Tattoo shortly after the firefight began. The owner, who had a 9mm handgun, fatally shot one suspect. “The other two armed suspects fled the business on foot and remain at large,” said Sgt. Curtis Davenport, a police spokesman. It is possible, but not confirmed, that the owner wounded one of those two suspects, Davenport said. I guess the reason that I say that this is both good and bad in a way, well the bad is pretty much obvious – I mean no one likes to see someone get killed, but the good or somewhat good is that the shop’s owner protected himself and his shop from criminals. Don’t get me wrong, I’m not defending the idea of shooting someone, but when it comes to either the good guys or the bad guys going down, I don’t think I’m alone in saying that I’m rooting for the good guys to come out okay. Naturally this is no one’s ideal situation, but it could have ended up even worse than it did. It’s especially strange for me when I see this type of story because this kind of thing just doesn’t happen where I’m from. Yeah, there’s robberies, but you very rarely hear of the owner of a store fighting back in this manner. As someone who spends a lot of time digging through the tattoo related news stories, I can say with some accuracy that the number of stories that I see in the news about tattoo shops being robbed are surprisingly high. Hopefully an incident like this will serve to discourage further tattoo shop robberies.